Mexican cartels have for many years been active on this side of the Mexico/ Texas border in drug and human trafficking, but are now often shielded by so called legitimate businesses. Terror on the Border vividly illustrates this growing problem. An innocent Mexican girl, Juanita Delgado, a victim of human trafficking, and her flawed ex-sniper American husband, facially disfigured in Iraq, heroically fight the malicious leaders of the Lobos cartel, led by egotistical Hernan Cortez and his evil enforcer, Manuela. The exploits begin when Juanita’s North American cousin, a Border Patrol Officer, Orlando Delgado, is kidnapped by the Lobos while on duty. He and Juanita, also taken hostage, manage to escape a torture chamber, only to face a fierce battle at Uncle Joseph Delgado’s ranch on U.S. soil near Laredo, a horrid kidnapping in Dallas’ posh Highland Park, and more bloody confrontations on and near the border. She and Orlando are joined in the struggle by her brave soldier husband and two Dallas private detectives. 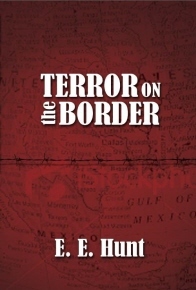 The twists and turns of Terror on the Border will rivet your attention as you learn more about the real nature of the evil cartels that have expanded into the U.S.
Read Amazon.com book reviews of Terror on the Border HERE. Terror on the Border Press Release — Unrivaled Books. Links to additional resources relevant to "Terror on the Border". This is a work of fiction, but the narcotics and human trafficking it depicts are all too real. Some of the incidents are based on fact; the Zetas, for example, are a real drug cartel born of Mexican Army Special Forces deserters whose members include corrupt former federal, state and local police officers. In Mexico, the human slave trade is a $20 billiona- year endeavor, second only to drug trafficking, according to Samuel Logan, founding director of Southern Pulse, an information network focused on Latin America. Mexico’s public safety secretary, Genaro Garcia Luna, estimates that Mexican drug cartels take in over $64 billion a year from their sales to users in the U.S. Scenes in this story take place on both sides of the border, involving English- and Spanish-speaking characters. Conversations in Spanish are rendered in English, with occasional well-known Spanish words inserted for flavor.